Elizabeth in Edgartown | From the Seasonally Occupied Territories . . .
Here’s the “just the facts, ma’am” version. My slanted, skewed, and otherwise non-objective commentary follows. This Sunday, July 1, Elizabeth Warren, candidate for the U.S. Senate from our state, will be at the Old Whaling Church in Edgartown to present her ideas and participate in a Q&A with attendees. Doors open at 1 p.m. The event runs from 1:30 to 3 p.m.
As political fundraisers go, this one is pretty affordable: a donation of $25, $50 or $100 will get you in the door. If you’ve got deep pockets and/or high spirits, more is of course welcome. Here begins my slanted, skewed, and otherwise non-objective commentary. Last November, in “Nonpartisan,” I blogged about my decision to contribute $25 a month to Elizabeth Warren’s campaign. I’m still doing it, though I’m going to skip two months in order to buy a $50 supporter’s ticket to the July 1 gig in Edgartown. Malvina Forester is now sporting an Elizabeth Warren bumper sticker. The late Tesah Toyota (1998–2003) wore a Studds sticker with pride. When Gerry Studds retired as U.S. representative from the Massachusetts 10th Congressional District, I made him my benchmark: My bumper would promote no candidate if I couldn’t support them as wholeheartedly as I supported Gerry. Elizabeth Warren is the first to pass the Studds test. Warren is a Democrat (big surprise), as was Studds. I usually vote Democratic, but I’m resolutely “unenrolled” when it comes to party affiliation. That’s not going to change any time soon. Why not? 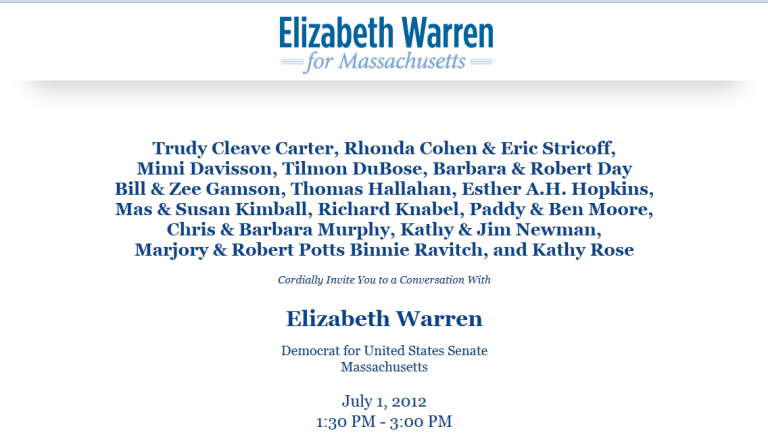 Well, take a look at the names on the invitation above. I chortled when I read it. In the middle of the fourth line is Richard Knabel, the selectman from my town who’s put serious effort into trying to make sure the island gets heard on the roundabout issue. On the next line is Chris Murphy, the current Martha’s Vineyard Commission chair, who has probably done more than any other individual to make sure we don’t get heard. Both are rallying behind a Democratic candidate who promises to help make our voices — the voices of ordinary working people, and others of modest means — heard in Washington. Over the last year, I’ve been acutely aware that there’s a Democrat in the governor’s office, and that MassDOT (the state Department of Transportation) is run by Democratic appointees. Our state senator and state representative, both Democrats, are gung ho to overturn the Supreme Court’s Citizens United decision but they’re mealy-mouthed equivocators when it comes to the anti-democratic process that’s trying to stuff this roundabout down our throats. As above, so below, people. On the global level, it may be dictators and financiers who are squelching democracy, but here on the ground we of more modest means are doing a pretty good job of squelching each other. Some people get it, and if you get it and speak out against the squelchers, go ahead and vote for Scott Brown and Mitt Romney: I don’t care. Some people don’t get it at all. They’re for democracy in Egypt and China and on Wall Street, but it makes them nervous when it’s up close and personal. Many of them are active Democrats. A couple of weeks ago I attended an organizing meeting for the local Warren campaign. For all the island connection, it might as well have been held in Newton or Amherst. 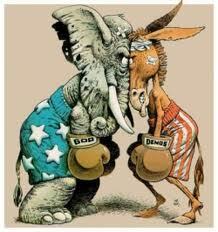 The struggle for democracy where I live is mostly nonpartisan. And that’s why, despite the Warren sticker on my bumper and the button on my jacket, I remain unenrolled. This entry was posted in Martha's Vineyard, public life and tagged Edgartown, Elizabeth Warren, Gerry Studds, Malvina Forester, politics. Bookmark the permalink.